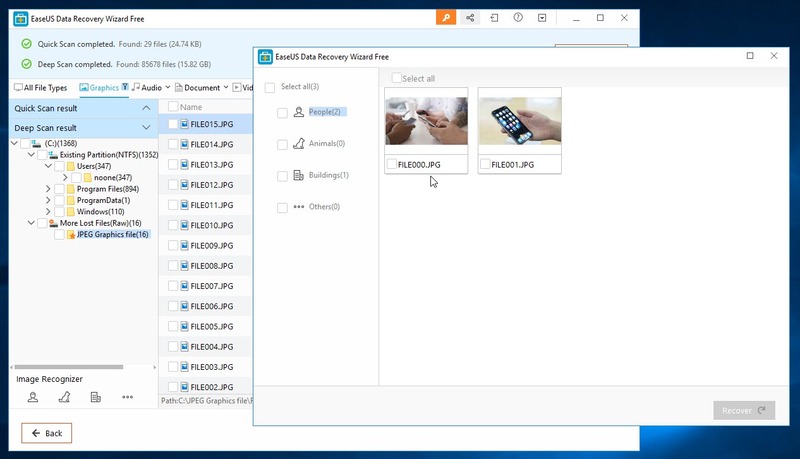 If you’ve ever accidentally deleted something from your hard drive or moved a file into a folder and couldn’t find it then the EASEUS Data Recovery Wizard software might be what you need to restore your missing and misplaced files. 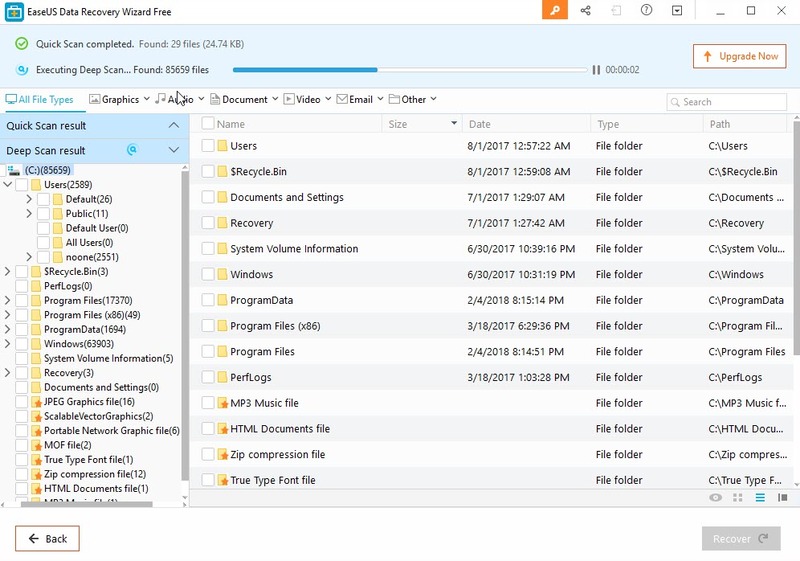 EaseUS Data Recovery Wizard claims to recover lost data from deleting, formatting, partition loss, an operating system crash, or virus attack. 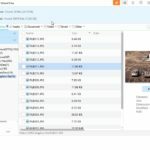 We didn’t test all of these scenarios but overall it seems like the software could help recover your files. 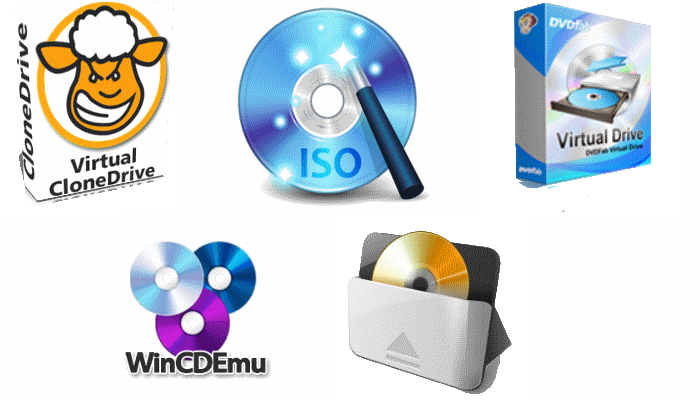 The software is available for all versions of Windows and more recent versions of Mac. For our tests we used a Windows 10 virtual machine with one hard drive attached. Later on in our testing we added a second hard drive. For screenshots of the software please see the gallery at the bottom of the article. The software is easy to install. If you only have one hard disk in your computer it will warn you that if you install it on the same drive that you’re trying to recover that it might cause problems. If you plan on recovering a lot of data from your drive then you should probably install the software somewhere else. You’ll also need a hard drive or USB key big enough to hold the recovered data. More on that in the “Restore” section below. 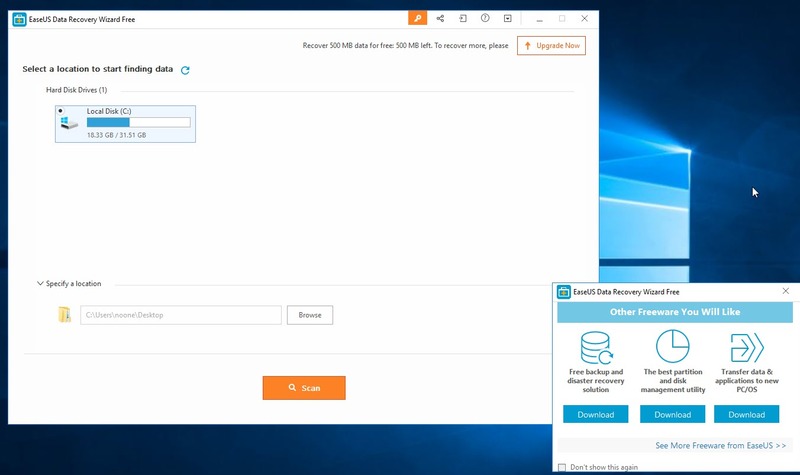 After installation, EASEUS Data Recovery Wizard runs a Quick Scan which finished in a few seconds and then it starts a Deep Scan which took a couple minutes. Our test machine did not have much data on it so the scans will likely take a lot longer on a well-used hard drive. The scan results are broken down into Quick Scan and Deep Scan. 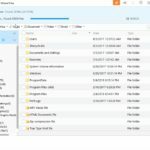 Files are listed in the folder where they were last found. 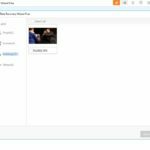 You can group the files by type: Graphics, Audio, Document, Video, Email, or Other. 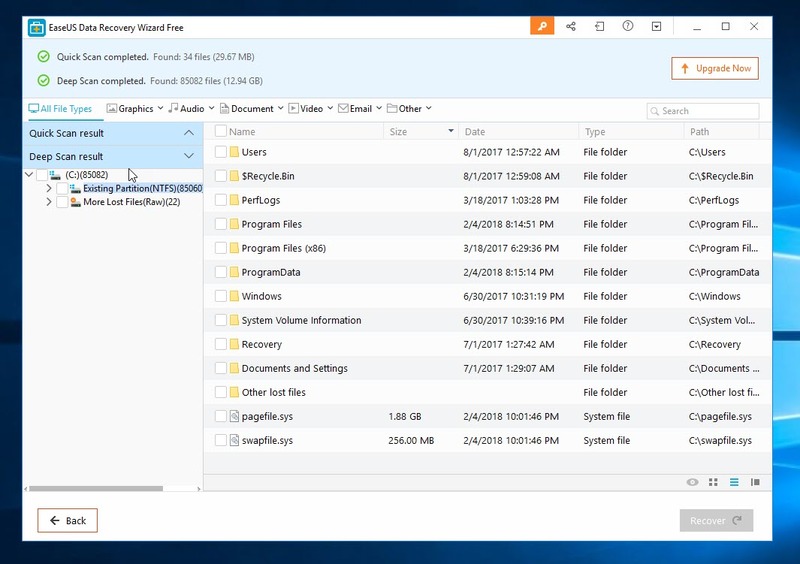 If you see a file that you’re not sure about you can right-click it and choose preview to take a quick peek at the file. You can also right-click a file and choose recover. If you need to shut down your computer but aren’t finished reviewing your results then you can save the results and reopen them instead of waiting for another full rescan when you return. This is especially useful on computers with lots of files. You can specify a folder rather than a hard drive if you want to limit the time spent scanning or rescanning the system. If you’re impatient you can click the “Back” button while the scan is running and it will ask you if you want to continue scanning, stop scanning and review your files so far, or go back home to select a different hard drive or specific folder. 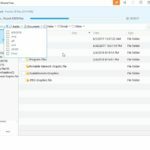 If you’re not familiar with the locations that Windows uses to store certain files you might find yourself Googling to figure out how to restore your iTunes media files, for instance. Luckily there’s a search feature. You can type “jpg” and it will show you all image files with the extension “.jpg”. You can right-click any of them to restore the file to its original folder. You can also click the drop-down arrow next to each of the categories and you’ll see options to limit the results even further by extension. The deep scan really just seems to be scanning and indexing your entire hard drive so that you can use the filters and search feature to find what you want. 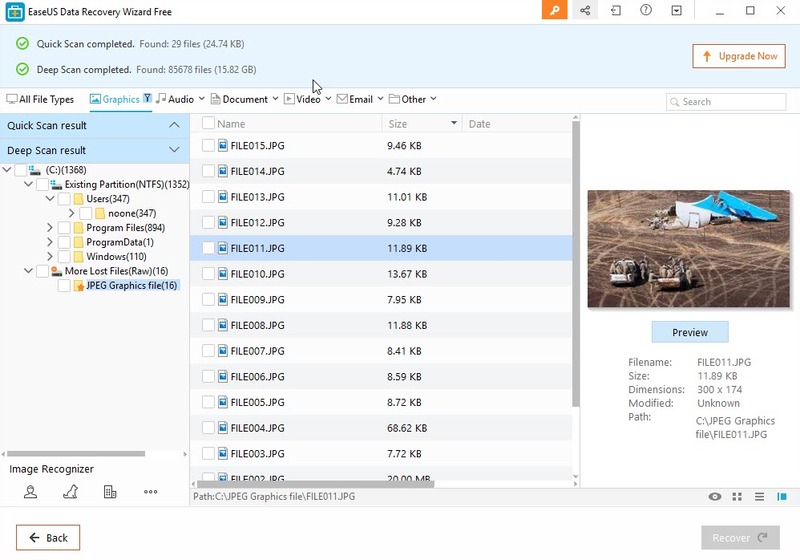 Another useful feature of this tool is the ability to review all images on your computer from any location. When restoring files you can select several files and recover them all at once. There are “views” that you can use to see the images in preview mode as you look through them. 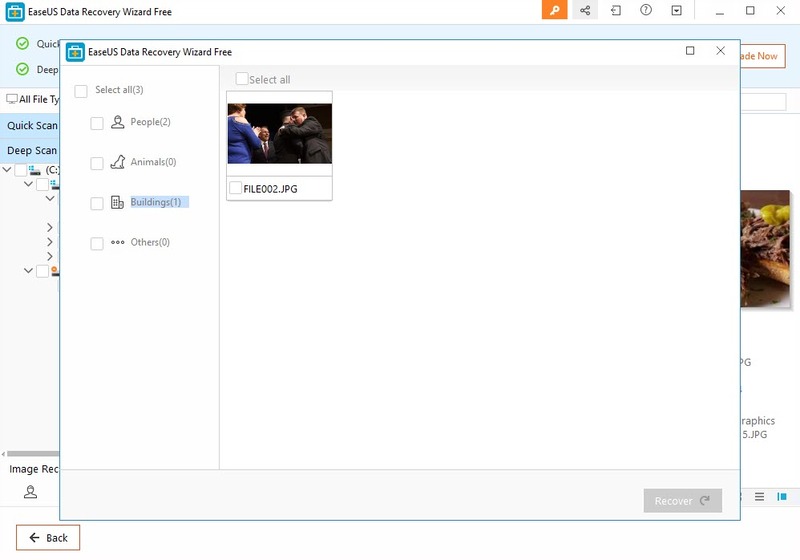 The image recognizer will further filter your files so that you can find pictures of people, animals, or buildings however the feature didn’t work as well as expected. 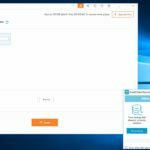 The trial is limited to restoring only 500 MB (1/2 a Gigabyte) of data which isn’t much and you will see occasional cross-promotional popups to buy other products from EASEUS. 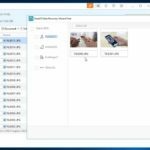 The software will warn you to put the recovered files somewhere else – you don’t want to restore files on top of the existing files in case you inadvertently selected some system files. If you did, you might risk damaging your operating system by overwriting the latest system files. And if the drive you’re scanning has been having problems or making clicking noises then you definitely want to get those files off of there before the drive fails. 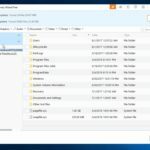 I deleted two files from my computer’s C drive – an image and the EASEUS download itself – and emptied the recycle bin. The software was unable to recover those files which is something they claim to be able to do. I tried it again later when I added a second drive and it was able to recover the image however it was behaving strangely. Too much to get into here so just know that if you can’t find the file that you’re looking for maybe try searching for it or shutting down the software and scanning again. You can also try looking on another drive’s recycle bin. In our initial examination of the data recovery software we only had one hard drive installed. We shut down our machine and added a second hard drive to test some of the partition recovery tools. 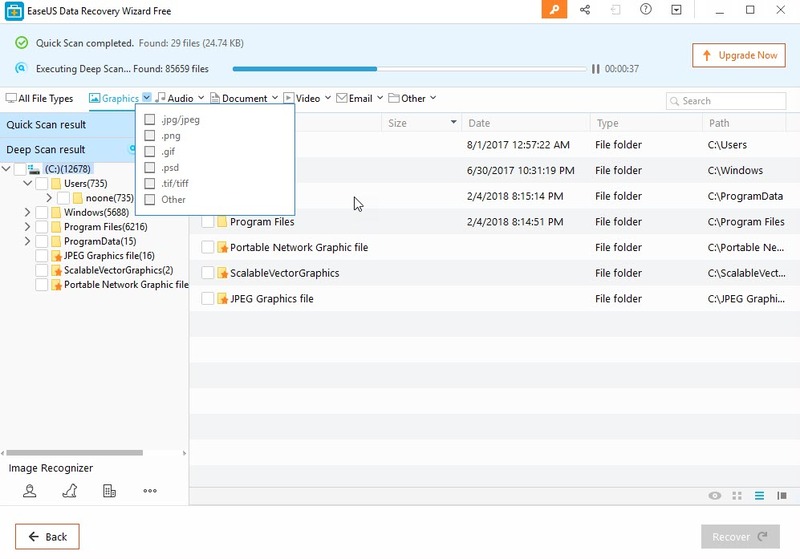 When you add a new hard drive to a computer it doesn’t immediately show up. 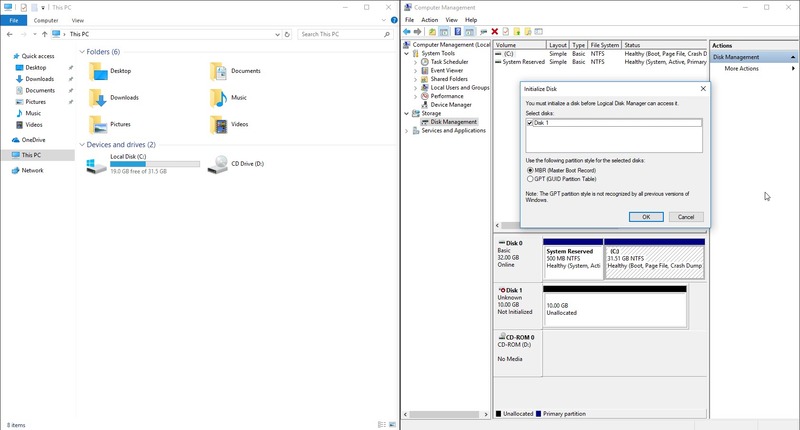 You have to go to Computer Management > Drive Management to format the drive and give it a drive letter. Before we did that, we started EASEUS Data Recovery and it noticed that we had a drive that was “Lost”. The drive was empty but we ran a scan on it anyway just to see what would happen. The deep scan took a surprising amount of time on an empty drive but perhaps it was just being thorough. 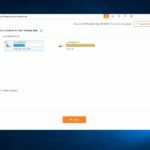 This is great news for anyone that has experienced a drive that got disconnected from the operating system and there was no way to access it. The weirdness in restoring from the Recycle Bin might be attributed to the fact that we had the software installed on the same drive that we were scanning. 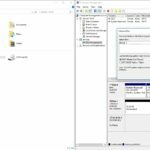 Though setting up a remote scan or adding a second hard drive is probably out of bounds for the average user so I’m not sure where else you could install the software except for a USB drive. We didn’t test that option in our review but it might be feasible. Otherwise, the scanning, searching, viewing, and restoring features worked well. And if you only need to restore a few files then the free trial should be plenty for your needs.